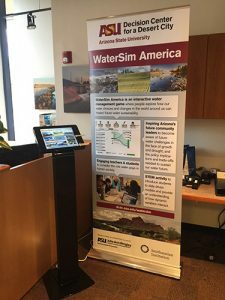 Expanding the modeling effort of WaterSim Phoenix, DCDC’s WaterSim America model is a unique hands-on, state-of-the-art immersive visualization tool used to explore the complexity of water supply and demand. WaterSim America explores water issues on a state level and has been implemented as a proof-of-concept exhibit within Smithsonian’s Museum on Main Street Water/Ways exhibition. 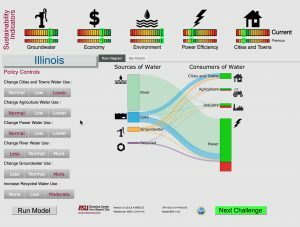 The interactive, educational game challenges visitors to develop custom sustainability solutions to specific water management issues in their own state. Learning from professionally-produced videos, engaging graphics, and an intuitive and simple-to-use interface, exhibition visitors select from a variety of realistic solutions to balance water supplies and demands. Sustainability indicators help users to understand the trade-offs they face between water conservation, agriculture, economic development, and environmental preservation. This nationwide exhibition travels to 24 states and 180 rural communities from 2016-2020. Water/Ways will tour Arizona from June 2018-March 2020. Developed by researchers at Arizona State University, the model uses the following data sources for water sustainability indicators. Data for this indicator was provided to us by Dr. Benjamin Ruddell at Northern Arizona University, in association with the NSF-funded NWEP and FEWSION projects.